As I shuffled the cards to select this week's Intuitive Tuesday tarot card, I said, "Tell me what messages I need to bring to my readers this week." 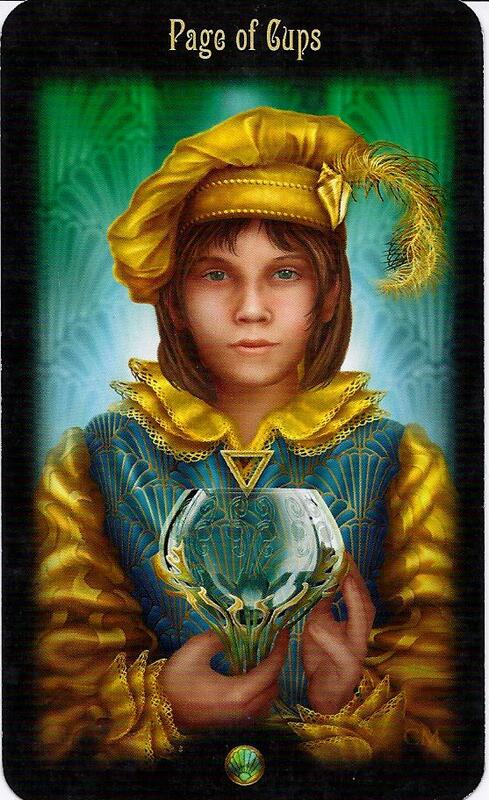 I selected the Page of Cups from the Gateway to the Divine Tarot deck by Ciro Marchetti. I have previously covered the Page of Cups. If you'd like to check it out, click here. A Page is one of the Court Cards (Page, Knight, Queen and King) which can represent people in your life. If a Page represents a person, it tends to be people who are novices or less mature (either chronologically or emotionally). I've not mentioned it yet on my blog, but our family is temporarily moving for the 2011-2012 school year. My husband has been appointed to the Senior Service College with his Army National Guard career, a very high honor. We will be moving our family for the entire school year. As you might imagine, our three sons, James, Bryce and Ryan, are filled with mixed emotions. James will be in 10th grade and the twins will be entering high school. Not the easiest time to be making such a BIG change, but certainly not the worst either. We are looking at it as an adventure. And I have a feeling (a pretty strong intuition), that even though we are all going there with some (maybe even some of us -- mostly under 15 years of age -- have a LOT of ) reservations, that about this time next year, we will be looking back thinking, "Wow! That went by REALLY fast and it was an awesome experience). We'll also be looking forward to returning home, with a much broader perspective and perhaps even more gratitude for our view of the world and our perspective of what "home" really means. This past weekend, we visited our new home and now have a pretty good idea of where we are going. What I witnessed is the Page of Cups in action. First because Pages can symbolize your children; Cups symbolize feelings and emotions; and/or Pages can symbolize a type of change, newness and excitement. Looking back at the bullet points above and the meanings for this card, how do you relate to the Page of Cups this week? Is it a person in your life, news, excitement, new feelings...or possibly all of the above? It couldn't be more right on. As it usually is. Well, this past week I have felt like a complete novice at something. And I am hoping for a new opportunity that has to do with communication and relationships. And I'm excited. So there. Right on, again. crazy, but I just had a conversation with my husband this morning about how "giddy", my exact word, I felt about something unknown beginning to gel. As for the reading... it makes me think of my pregnancy. This morning, I said to my BFF "I love this little guy so much already, it makes me cry" - yet at the same time, I'm feeling quite scared and overwhelmed.